Are you ready to become the mightiest magician in the cosmos? Think you can balance the use of both white and black magic? Well, if you're ready to defend our realm from all sorts of mystical threats, then drop that burrito supreme and start acting like a Sorcerer Supreme! If you want the all powerful Dr. Strange to take you in as one of his disciples then first you'll have to be completely selfless. Com-Plete-Leeey! Like, willing to defend the world with or without the title of Sorcerer Supreme. Besides that all you have to do is have the rights duds! We don't mean a black suit with a top hat and a cape... No, you're not going to be pulling bunnies out of odd places and sawing people in half. We were thinking of something similar to the mystical garbs Strange wore himself. 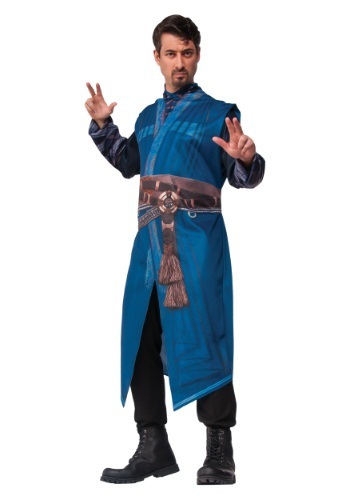 Take a look at this Adult Deluxe Doctor Strange Costume! Once you slip into this one piece garment you can comfortably run around practicing your sorcery and martial arts. You won't have to worry about adjusting your robe or belt at all with this tunic. Now we may have said no to capes earlier but we never mentioned anything about cloaks! Get your hands on a magical Cloak of Levitation to really complete your new look. Also, some bling never hurts, so if you should happen to come across an Eye of Agamotto amulet feel free to toss that around your neck! Once you show off your newly found selflessness and pristine magical look, Strange will dub you worthy to be his latest apprentice! Make sure to heed his every word, we heard that eventually he even teaches the spell to conjure up the ultimate supreme pizza!